Is your current screen door or security screen outdated, worn door and contact letting insects into your property. We have seen countless examples over the years of older properties that have had neglected security screens for years on end. But not to worry, the team at Max Security Doors & Screens are here to help you. In fact we are the experts when it comes to all Crimsafe Security Door Goolwa. Did you know that older screen doors and security doors are a victim of constant break-ins. Here at Max Security Doors & Screens we are here to fix that problem. We are the specialists in all things Crimsafe security doors in Goolwa and surrounding areas. Our worksop is that largest in the southern suburbs of Adelaide. We are also one of South Australia’s largest dealers of all Crimsafe products. We are only a short drive away and service the entire Fleurier Peninsula area. For all of our services both on security doors and security windows on all of our Crimsafe security doors in Goolwa give us a call. We will arrange a time to offer a complementary measure and quote. Including all custom screen door or security windows. The photo below show the completed job for a Crimsafe Security Door Goolwa. 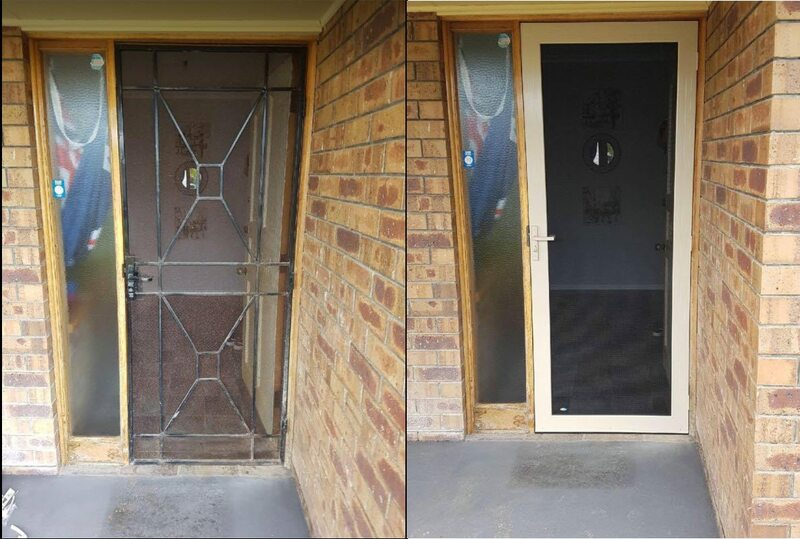 This photo is a before and after of an older style security door and security mesh that has been neglected for years and would be a prime example of what an updated system would look like. If you would like something similar to this, or even just want to get a free measure and quote and see what other options are available please contact us on 08 8186 5733 and one of our friendly staff will help you out.